These darling boxes are lots of fun to make. Included are laser cut cardstock parts for the box, and laser cut lining and artwork papers. 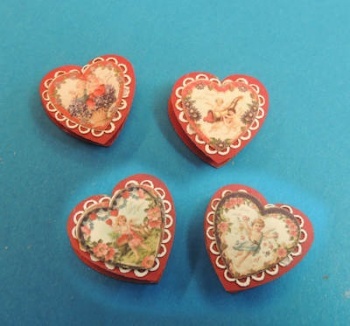 The artwork is taken from antique valentines and is just wonderful! Also included are two wooden forms to make the boxes over, which makes this an easy project. The lids are removable and both bottom and lid are lined with gold paper, so these boxes are ready to fill if you desire. 1" across from of heart to point.